Shown above is the chemical structure for penicillin. Which of the arrows is pointing to an amide group? The correct answer is arrow B. An amide group is a carbonyl group with a nitrogen that is in the alpha position (directly attached to the carbonyl carbon). 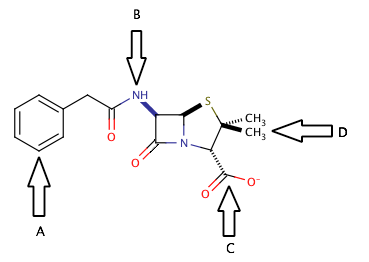 Penicillin has two different amide groups in its chemical structure, but only one has an arrow pointing to it in the diagram. Arrow B points to a primary secondary amide, bond to one hydrogen and two carbons. The other amide in the molecule is a tertiary amide, bond to three carbons and no hydrogens. Which of the following statements about amide bonds is NOT true? A secondary amide has the following structure. Amides have a structure of a ketone group adjacent to an amine group. In an amide bond, all of the atoms (the nitrogen, the carbonyl oxygen, and carbonyl carbon) are hybridized because of resonance; the lone pair on nitrogen can delocalize into the carbonyl pi bond. The amide bond is polar, mildly acidic, with a secondary amide having the structure shown. Finally, amides are often formed by a condensation reaction between a carboxylic acid and an amine, which produces water as a byproduct. Drain cleaners are a common household staple, used to open clogged drains in bathtubs and sinks. Human hair is a common culprit that clogs pipes, and hair is made predominately of protein. Drain cleaners are effective at breaking down proteins that have accumulated in plumbing. Drain cleaners can be either acidic or basic, and are also effective at breaking down fats that have accumulated with proteins. The NH4 molecule produced in Reaction 2 must have __________. The additional H present on ammonia (NH3) requires the generation of the a positive charge on the molecule. This also must be created to balance the negative charge created on the associated anion product. Which of the following amines is the strongest base? Amines act as bases due to the lone pair on the nitrogen. Amine basicity can be increased or decreased by functional groups attached to the nitrogen. Electron-withdrawing groups decrease the basicity of an amine by lessening the effect of the lone pair, while electron-donating groups increase basicity by amplifying the lone pair effect. As a result, a secondary amine with an electron-donating functional groups will be the most basic amine. Ephedrine (shown below) contains what type of amine? A secondary amine is an amine (nitrogen atom) that is attached to two carbon-containing groups (alkyl groups or aryl groups). The nitrogen in ephedrine is attached to two alkyl groups, making it a secondary amine. Primary amines are generally written as . Secondary amines are generally written as . A tertiary amine will be bound to three different R-groups. Quaternary amines require a positive charge on the nitrogen atom to accommodate a fourth R-group. Your lab isolates a compound with the formula . Upon further analysis, you determine that the base structure is a benzene ring with a single constituent. 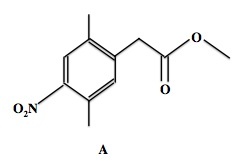 Which of the following could be the identity of the compound? Nitro groups and amide groups both contain oxygen components, and cannot be found in the compound described. We also know that the benzene ring only has a single constituent, meaning that it cannot be a methylamine. The compound must be benzylamine, a benzene ring with a -CH2NH2 substituent. What is the name of the functional group that contains a vinylic hydroxyl group? Enol functional groups contain a hydroxyl group bonded to a carbon involved in a double bond with another carbon (vinyl carbon). An enol will usually undergo tautomerization to become a more stable keto. 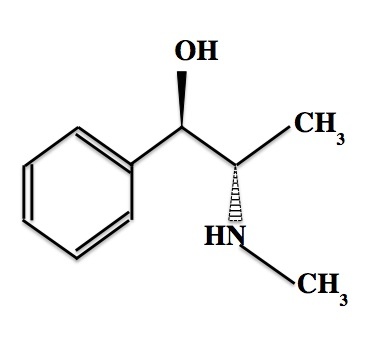 Ephedrine, whose structure is shown below, is used commonly as a stimulant and decongestant. Ephedrine contains all of the following functional groups except __________. Ephedrine contains an arene (the aromatic benzene ring), an alcohol (the -OH group), an amine (the nitrogen-based group), and an N-methyl group (-CH3 attached to nitrogen). It does not contain a ketone (C=O), or any other carboxyl groups. Which of the following compounds would you expect to undergo a nucleophilic addition reaction? When dealing with carbonyl compounds, remember that a carboxylic acid and all of its derivatives will undergo nucleophilic substitution. Aldehydes and ketones will undergo nucleophilic addition. Propanal is a three-carbon aldehyde, and will thus undergo nucleophilic addition. Acetic acid is a carboxylic acid, methyl ethanoate is an ether, and ethanamide is an amide; each of these would undergo nucleophilic substitution. Compound A, shown below, contains an example of what type of functional group? Esters have the general molecular formula of , where and are carbon groups. The rightmost region of compound A shows an ester. Ketones have the formula of , with a carbon-oxygen double bond. Ethers have the formula of , with an oxygen linked by single bonds within a carbon chain. An ester resembles adjacent ketone and ether groups. Carboxylic acids have the formula , resembling an ester with a hydrogen in place of a second carbon chain. Finally, the nitrile group has a formula of , with a triple bond between nitrogen and carbon. Compound A also contains an aromatic function group (the benzene ring) and a nitro group, , on the far left side.